This product was added to our database on Thursday 3 November 2005. In 1939, Hughes Aircraft used a special wooden structure which strength comparable to steel for a proposal of bomber design, the model D-2. The project interested USAAF because metal material was becoming a scare by the war. In 1942, the D-2 was ordered under an attack aircraft designation XA-37. Later it was considered as a night fighter XP-73. In 1943, the wooden D-2 prototype was lost by fire accident in Hughes facility before it was inspected by USAAF. Based on its high speed and light weight records, USAAF purchased another metal structure version as a reconnaissance aircraft, the XF-11. Due to the engines delay, Hughes could not complete the aircraft even the war was over. USAAF decided to cancel the project but still paid for two prototypes. 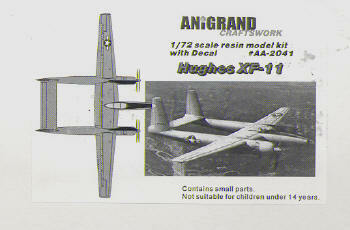 In 1946, with Howard Hughes himself at the control, the first XF-11 made its first flight but destroyed by crash, once again USAAF had not inspected. The second XF-11 was modified and completed in 1947, and it was flight tested during 1948. Afterward Hughes created aerospace and helicopter divisions, and never built other airplane.